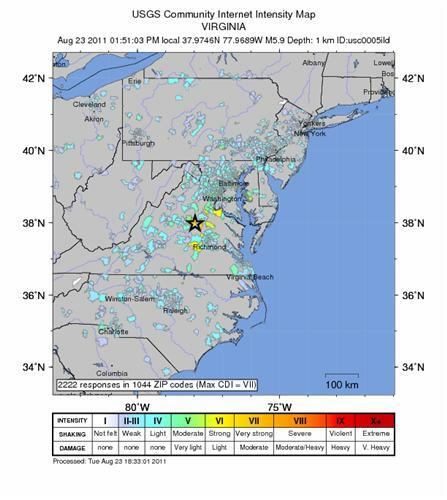 It’s possible that some East Coast residents may have seen tweets about today's quake in Virginia before the ground shook if they were far enough away from the epicenter. That’s due to the way the shock waves travel. USGS map shows the epicenter of today's quake on the East Coast. As of 3:45pm ET Tuesday, the hashtag #dcquake was the second-most-talked-about subject worldwide on Twitter; that and the #earthquake tag were the top trending topics in some of the cities most affected, which included Washington, D.C., New York, and Philadelphia. Twitter could have been one of the few ways those affected could get through in the minutes following the quake: MSNBC reported that Verizon Wireless suffered heavy congestion on its East Coast network, and anecdotally I can report that AT&T calls from time to time failed to connect. Text messaging worked like a charm, though, and is the recommended method of communication, according to wireless industry group CTIA. I am located in Reading, Pa., and I sure felt it. I was actually in contact with a PCWorld editor talking about the news of the day when my home office began to shake. It was just like the earthquakes you hear about in California: a slow rolling motion that builds in intensity, then slowly stops. Yes, I ran for a doorway. The shaking seemed to last about 30 to 45 seconds. Given that it hit a so-called “megalopolis,” the social media networks lit up like a Christmas tree. Facebook walls sped into overdrive, and Twitter was quickly awash with reports of the experiences of those affected. Above and beyond the obvious spike in communication, social media is also helping scientists to better understand the quake. For several years now, the U.S. Geological Survey has been using a platform called “Did You Feel It?” which crowdsources anecdotal reports from the Internet on earthquake events. If you indeed felt it, head on over to the USGS site and describe what you felt. The reports will be used to develop a broader picture of the severity of quakes and to aid in the agency’s research, it says. Even if you didn’t feel Tuesday’s temblor, I suggest that you check out the USGS coverage--it's pretty stunning how far away people felt the earth move.